Electronic Arts is throwing DMCA takedown notices at sites hosting free versions of Ultima 4, fueling rumors that a real, Mythic-made remake is in the works. It's been 14 years since the good folks at Origin and EA gave permission to a few websites to give away the Computer Gaming World CD version of the 1985 classic Ultima 4, so it seems a little odd that the company would suddenly starting passing around takedown notices to several of the sites hosting the game. Yet the Flash-based versions at Master System 8 and Phi Psi Software are both gone, as are direct download links to the DOS-based edition at xu4 and Ultima Aiera. Nobody knows exactly why, but as Ultima Aiera explained, EA is well within its rights to insist that the freebies be pulled. 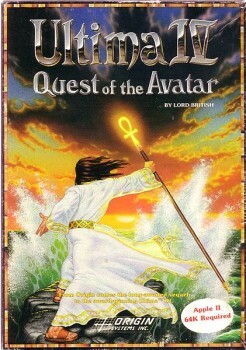 The Ultima 4 giveaway was completely legit but the game was never actually released to the public domain; it was instead more of a "gesture of goodwill." EA still holds the copyright and can drop the hammer on sites giving away the game whenever it wants. And drop the hammer it has. Ultima 4 has been freely available for as long as Duke Nukem Forever has been in development, so it's pretty clear that something has lit a fire under EA. One possible explanation making the rounds is that an Ultima 4 remake is in the works. Paul Barnett, the creative director at EA-owned Mythic Entertainment, has tweeted a couple of times about "secret projects" at the studio and a job posting for a "web architect" for an unnamed EA MMO went up on Gamasutra yesterday. It's thin, it's very thin, but it makes a lot more sense than the alternative, which is that EA is just in a mood.